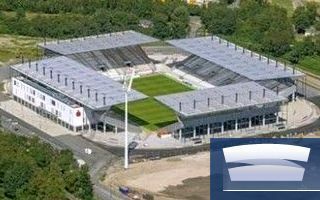 As Essen and their largest club Rot-Weiss entered the twenty-first century, the need to redevelop or replace Goerg-Melches-Stadion became apparent. The popular football destination saw first phases of demolition in the summer of 2009, making room for the new stadium, which was built partly on the same plot, north-west of the predecessor. And just like Georg-Melches-Stadion, the new arena was to be a traditional football-specific ground with no corners, but fully covered. And again like the predecessor, it has no excessive decorations, kept plain and simple with only light mesh veiling some of the steel structure. Even the main office building’s main decorative element is the window layout, how minimalistic is that? Of course there’s nothing wrong about being modest, especially if it leaves you with one of the cheapest stadiums on the list. Cost per one person (seat or terrace, there are 9,040 standing places after all) is only €1,900 and that includes cost inflation of the project, while initial value was even lower. Even with the tight, disciplined budget the stadium offers 11 skyboxes for 290 people, further 1,100 business seats and the tribune of honour for 1,900 more. That sounds more than fine for the demand of Rot-Weiss, currently aiming at promotion from the fourth league. And should they succeed, there’s already a sound plan of how to increase capacity up to 35,000, sufficient even for Bundesliga clubs. First 4,000-5,000 seats need to be added in the corners and once the stadium creates an enclosed bowl it’s ready to accept a second ring of stands, providing another 10,000. The opening took place after just 16 months of construction in mid-2012, though the southernmost stand wasn’t ready at that time. Progress on that part was possible only after the club moved to the three ready stands, because room on the old stadium turf was needed. This is why we nominated the stadium this year, as the last phase ended in August 2013. Interestingly, as Rot-Weiss left their old spiritual home, they left one floodlight mast standing as a reminder of Georg-Melches-Stadion. Once illuminating the pitch, it’s now addressed at the newly created parking lot. Cost-effective, reasonable and with a long-term plan ready – is this enough to make your mind up about this pure football stadium in Germany? Please share it by voting for Stadium of the Year 2013 by midnight on Saturday!